that each sheet should take someone from not knowing what a particular social media tool is, nor how they would use it – to at least having taken the first steps to using it in a sensible and sustainable way. And it should do that in no more than one side of A4. Use the same creative commons on your work. Let Practical Participation know about any adaptations or derivative works. 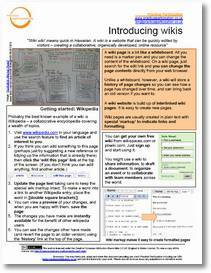 Here is an example of one of his one page guides on Introducing Wikis as a PDF for Printing version and a Word Document for Editing. What is your opinion? Do you like the idea of the one page guides? And if so, what other Guides would you add to the series. If you like the Guides, please let others know about them in your network and drop past Tim’s blog to congratulate him on his hard work. Are You Going To Be More Sharing And Caring? Pingback: kouragethekowardlydog » One Page Guides For Engaging Others! Thanks for this Sue – at the OU we’re developing a learning design/pedagogic planning tool and one of the things we want to link out to are relevant support guides. We have the educause ‘7 things you need to know about…’ guides, some stuff from the Pheobe project at Oxford and these look ideal too. Well I would definitely like to see someone introducing the Ning community in one page. Hi Violeta – Happy New Year to you as well. I will let Tim know that you like his one page guides and ask if he is considering writing one on Ning.